An issue of al-Kown dated June 24, 1909. An issue of al-Kown dated June 10, 1909. An issue of al-Kown dated February 25, 1909. 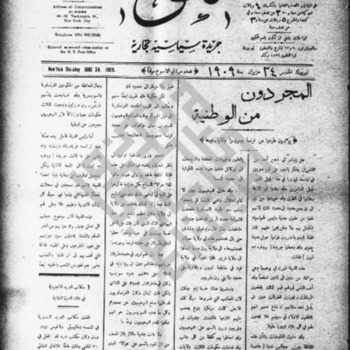 An issue of al-Kown dated January 21, 1909. An issue of al-Kown dated June 25, 1908. An issue of al-Kown dated March 19, 1908. An issue of al-Kown dated September 24, 1908. An issue of al-Kown dated September 10, 1908. An issue of al-Kown dated June 4, 1908. An issue of al-Kown dated November 14, 1907. An issue of al-Kown dated November 7, 1907. An issue of al-Kown dated October 31, 1907. An issue of al-Kown dated October 17, 1907. An issue of al-Kown dated October 3, 1907. An issue of al-Kown dated September 26, 1907. An issue of al-Kown dated September 19, 1907. An issue of al-Kown dated September 12, 1907. An issue of al-Kown dated September 5, 1907. An issue of al-Kown dated August 29, 1907. An issue of al-Kown dated August 22, 1907.